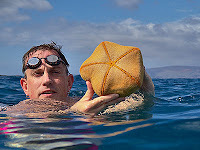 We saw lots of critters during this morning's ocean swim. 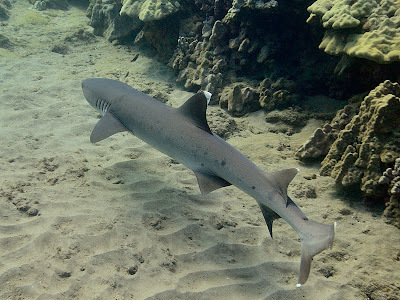 This scardey cat shark (above) was waiting for us by the arch but swam away when we got too close. Green Sea Turtles were everywhere and this one (below) had a custom racing stripe down the center of its back. 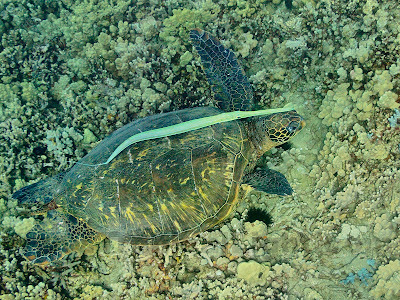 This Cornet Fish stuck to the back of this turtle like it was glued on, enjoying a ride safe from predators and a perch from which to capture unsuspecting prey.